Google(s goog) and Boingo(s wifi) are building on their free Wi-Fi project in New York City, launching the advertising-paid access model in eight malls across the country. Though the project is still in its infancy, it represents a growing trend to make Wi-Fi a free and readily accessible resource, while depending on ad views to pay the bill. Boingo and Google didn’t name the specific malls, saying only that at least four of them would be in San Francisco, Los Angeles, Tampa and Seattle. Google Offers will sponsor the service, meaning customers connecting to the hotspots with a smartphone, tablet or PC will encounter a welcome screen encouraging them to sign up for Google’s daily deal service. Regardless of whether customers sign up for the service or skip past the screen, they’ll get free, unrestricted access. In New York, Google and Boingo have offered the promotion in six subway stations and 200 hotzones throughout Manhattan on a trial basis until Sept. 7. The two are also working together to offer discounted Wi-Fi access in sixteen airports. Google Offers will be selling a half-off 24-hour pass for Boingo’s global footprint, which customers can buy when they log into any of the airport networks. 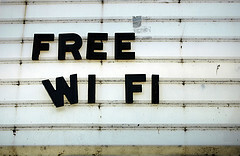 Wi-Fi is already freely available from many restaurants, cafes, shops and other business that use the lure of free Internet to attract and retain customers (Boingo just signed a deal with the Wendy’s fast food chain to manage its free network), but at high-traffic locations with captive customers – airports, hotels, conference centers, etc. – paid Wi-Fi is still a big revenue generator. A growing number of locales are trying to change up that business model, shifting the costs from consumers to advertisers. Boingo just bought Cloud Nine Media, a sponsored Wi-Fi deal broker. Another player in the public Wi-Fi space Advanced Wireless Group is starting to challenge Boingo’s dominance in U.S. airports, offering a multi-tiered Wi-Fi subscriptions ranging from free ad-supported access to paid prioritized access. It’s already cut deals with 15 U.S. airports. In New York, the city is working with Van Wagner Communications to turn payphones into Wi-Fi hotspots that require users to visit the city’s tourism website to get access but could feature advertising in the future. Even AT&T(s t) is getting into the act, offering free video-ad supported access at Dallas Fort Worth International Airport. Such a strategic move by Google! A mobile OS vendor who is paying for free WiFi for any user BUT his direct competitor. WiFi is an interesting space these days. It will be interesting to see how this one ends. There is also another service called Wavespot that don’t just provide free Internet at business locations, but also help them market their services over Social Media. Sign up for boingo once in an airport and they will charge your credit card every month – seems dishonest to me. They should make it clear and offer a onetime charge option!